A virtual number allows your business to appear local regardless of where you are in the country. This is important if you want customers to be able to reach you without paying for long-distance calling or you have offices set up all over the globe. While most companies offer virtual numbers, not all can offer you virtual local and international numbers. That is why our list of the Best Small Business Plans for Virtual Numbers includes those that offer international calling – so if you are overseas, you can still give customers a local number to call you back at. Ring Central tries to cater to every potential need of a business. Whether you’re in the United States or overseas, you can get virtual numbers from the team at Ring Central. Ring Central also offers innovative plans with deep discounts if you pay annually. In addition to local and international virtual number capabilities, they can offer your business unlimited local and long distance calling, generous amounts of toll-free minutes and up to 40 features for free. If you are willing to trade unlimited calling for minutes, you get extensions added in free. Ring Central’s Professional Plans start at $24.99 per month (Pro Plan) for 300 minutes and two extensions, $29.99 per month (Pro Plus) for 1,000 minutes and five extensions and $39.99 per month (Pro Power Plan) for 200 local minutes, 1000 toll-free minutes and up to 10 extensions. If you opt for the annual plan – where you pay upfront per year, your price can go down to $14.99 per month for the Pro Plan, $19.99 per month for Pro Plus, and $24.99 per month for Pro Power. Try it risk free for 30 days. You don’t have to worry about trying and not liking, because Ring Central offers a 30-day free trial for you to see if their service is the right fit for your business. Virtual PBX offers affordable monthly subscriptions for those that want virtual local or international numbers. With their plans you still get all of the features for a standard number, but you will have to pay an upfront cost. Additional virtual numbers can be purchased at $5 per line, per month too. With Virtual PBX, you get a service that is paid month-to-month and includes unlimited local minutes as well as up to 1,000 toll-free minutes. 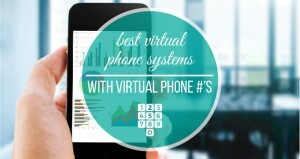 Virtual PBX offers office plans and Anywhere plans to meet the needs of their customers. Office plans are for those with a fixed location, while the AnyWhere plans accommodates on-the-go professionals. With Office plans you can choose from one to over 100 lines, ranging from $33.99 per month to $19.99 per month. With the AnyWhere plans, expect to pay $9.99 per month to $24.99 per month and have minute restrictions. You can save 10 percent today on Virtual PBX Services. 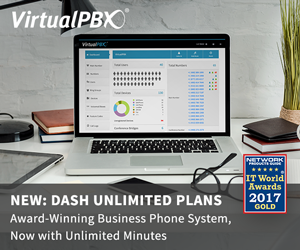 If you start your service today, Virtual PBX offers a 10 percent discount off their monthly rate – making it even more affordable to get your virtual number. Phone.com is so reliable that even Revuezzle uses them for our phone service provider. As the only provider to offer a truly unlimited plan, they also offer virtual local and international numbers – giving your business the flexibility you need. 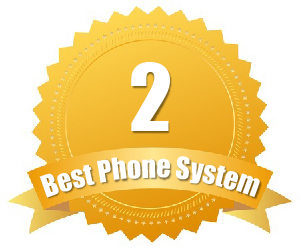 You can pick and choose between virtual local and long distance numbers and also choose a pay-as-you-go plan or just opt for unlimited calling and unlimited toll-free minutes. You will also get features like caller ID, call waiting, voicemail, easy call management, and advanced features like iNum, call analytics, call recording, premium hold music and more. You can get 100 minutes per month for just $9.99 per month and spread it across all users. After that, just pay 3.9 cents per minute over your 100. If that isn’t enough, opt for unlimited minutes extensions for $23.99 per month, per user for no restrictions and unlimited local and long-distance calling. Save 20 percent off the base plan today. You can get up to 20 percent off the base plan of $9.99 per month for the first 12 months, today if you order your Phone.com plan via Revuezzle. Use link to the right and coupon code: 20OffPlusVO. Grasshopper offers a competitively priced virtual phone system for companies of all sizes. No matter your reasons for doing so; you can get Grasshopper’s virtual local and international numbers with great rates. 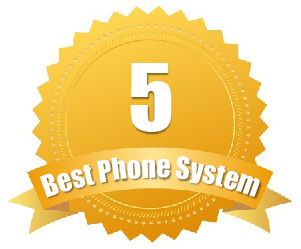 When you sign up with Grasshopper, you will have four plans to choose from and because they are designed to help those professionals always on the go, you will get access to features like softphone, mobile phone forwarding, voicemail to email or fax, voicemail to text, unlimited call handling, hold music, conference calling and more. You have four plans to choose from, which include: Pay As You Grow (Starting at $12 per month and 6 cents per minute with 1 toll-free or local number), Ramp (Starting at $24.00 per month, 500 minutes, and one toll-free or local number), Grow (Starting at $49 per month, 2000 minutes, and 2 toll free numbers or local numbers), and the Max ($199 per month, 10000 minutes, 3 toll-free or local numbers). You can save $75 right now on your Grasshopper plan. When you click the order link through Revuezzle, you get access to a $75 discount for your first month’s service! 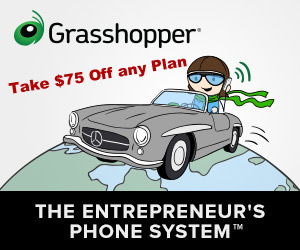 Take $75 Off Any Grasshopper Plan Now! eVoice offers multiple numbers and extensions as part of their plan – saving you the hassle of the per user, per month pricing. All plans come with their Advanced Features and there are no contracts for using eVoice. If you go over your minute allotment, they offer low, competitive per minute pricing. Enjoy features like 24/7 customer support, call recording, international numbers, inbound/outbound faxing and even a live receptionist service. You have four plans to choose from with eVoice, which include: Professional Plan (300 minutes, 6 numbers, 2 extensions for $12.99 per month), Small Business 1000 (1000 minutes, 15 numbers and 5 extensions for $29.99 per month), Small Business 2000 (2000 minutes, 30 numbers, 10 extensions starting at $49.99 per month), Small Business 4000 (4000 minutes, 45 numbers, 15 extensions for $79.99 per month). Want a free trial? You’re in luck! You can get a 30-day free trial right now to see if eVoice is the right VoIP provider for your business.